I’m wearing Louis Garneau’s shoes. I’m sure he won’t mind and I think he’d like it if you wore his shoes too. Specifically I’ve been wearing his 0 (Zero) Degree Grip winter Mtb shoes. At first glance the name implies a type of slippery disco slipper that provides zero grip when doing the bike dance in the woods, but oh, it is grippy, and cozy. These have been on my feet exclusively for the last couple of months as temps have dropped from the brisk 40’s to the bone chilling teens, from leafy cover to rainy slop to frozen tundra. On Single Speed Mt. Bike, Cyclocross, and a few road rides his shoes kept toes warm, sweating even, for several hours in temps above 40. Below 30 and into the teens, toes were warm with thick wool socks. Running with the cross bike a bit got the blood moving enough to give it another round of pedaling in temps below 20. I have pretty poor circulation in the feet from riding in the cold without proper protection over the years but this shoe kept me very warm despite the lack of insulation like other winter riding shoes out there but a good pair of wool socks makes these ideal. The neat design allows toe warmers to be placed inside the protective outer shell so getting into colder temps comfortably wasn’t a problem. Another great feature is the insole which has a metallic layer that reflects body heat wthin the shoe so I found that if I put my foot in the shoe nice and warm to begin with it stayed that way longer. 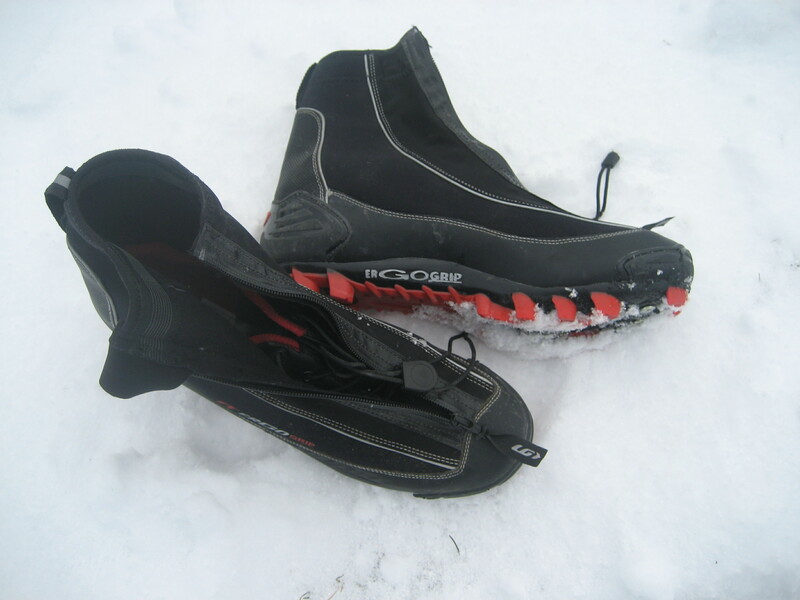 The shoe is very light for a winter shoe because it is built on a standard Mtb shoe last with a neoprene outer shell. It uses a cinch pull lace system for a secure fit and the outer shell zips over the front of the shoe creating a waterproof barrier that stood up well to deep puddle dashing. Plenty stiff, it delivered great power transfer yet was confortable enough to run in. Other features include reflective piping around the perimeter and outstandingly sturdy construction of the seams, laces and zippers. Louis’ shoes cleaned up really well even after being drenched in mud so i can impart that they will look good and hold up for years to come. For fitting I chose a full size larger than my normal cycling shoe and used nordic ski socks that were closer to a trail running sock thickness with a thicker cuff around the ankle. The colder it is the thicker the sock you’ll need to insulate. Retail is $179.99. Had I known how beneficial winter shoes could be I wouldn’t have froze my toes over the last decade with shabby shoe covers. These should keep you going year round with clipless pedals.